The government has approved the acquisition of a second batch of four P-8A Poseidon maritime surveillance aircraft. 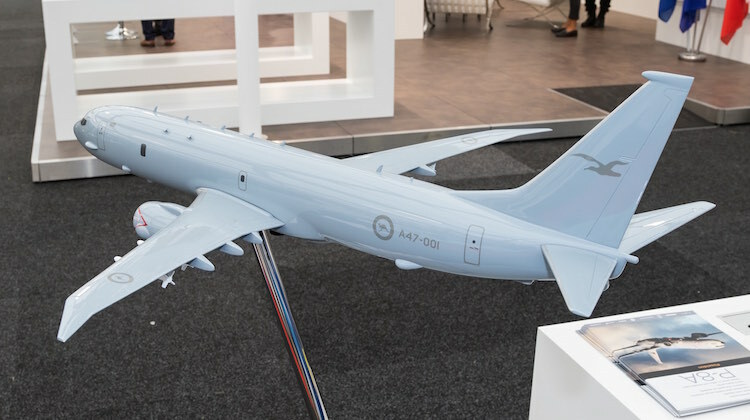 Approval of the first of those additional tranches of P-8s was subsequently announced by Defence Minister Senator Marise Payne at the RAAF’s Air Power Conference in Canberra on Tuesday. “As foreshadowed in the White Paper, I can indicate today that the Government has approved the acquisition of four additional P-8A Poseidon maritime surveillance and response aircraft, bringing the total number of P-8As on order to 12,” the Minister said in a speech that also confirmed the entry into service date of the MQ-4C Triton maritime surveillance unmanned aircraft system. Both the P-8A and MQ-4C are being acquired to replace the RAAF’s current AP-3C Orion aircraft. “The first of the Poseidons is expected to be delivered late this year and 12 aircraft will be in service by 2022,” Senator Payne said. Government spending really is out of control. Oh dear … Can’t see how that comment can be responded too. Just keep your political views to yourself and leave the Defence of our vast country and ocean territories to those of us that have a grip on reality. No it’s not, tipo. This is one part of Defence’s transformation under Project Jericho and has been budgeted for, and in some cases, already paid for. The P-8’s are replacing our near 50 year old P-3s. The mission profile of these assets is critical to our maritime operations and the interest of Australia. Australia’s defence budget is expected to increase to 2% of GDP by 2023. I hardly call that ‘out of control’ spending. I’ll leave you with this, tipo. A government’s number 1 priority is the defence and protection of the nation and its people. Period. I’ll let you pontificate on the rest of its priorities based on what you think is important. But number 1 is not open to discussion. Ever. The P-8 acquisition has been a planned replacement for the P-3 for a longtime now. With the current state of border patrols and anti-piracy activities overseas the ADF deserves the best equipment available. The P-8 will be a great asset to the ADF and the people and interests they protect for many years to come. We can’t stand here and say government spending is out of control. If we held off and didn’t spend the money now the opportunity for the P-8 was pass us by. Then we’d have people complaining about our ageing P-3 fleet and why the government did’t replace them sooner. Tipo your comment is a typo. Not out of control but playing catch up due to neglect by past governments. Our defence force needs the best equipment to defend our country and protect the lives of our defence force personnel. Even in tight economic times Governments still need to spend money on essential long term items. Outlining the next batch of a staggered purchase could hardly be called spending out of control. I would say it is responsible and well planned spending. Nearly all our Defence equipment is at bare minimum numbers to do the job in an emergency. The Australian EEZ = 1/9th of the earths surface so this is a badly needed capability, really we need 2-3 times this number. We are vulnerable to having our trade routes to North Asia cut off if things went south. As a long term Defence follower i found the DWP excellant, well put together, not asking for the impossible like Carriers, Armoured Divisions & large Bombers. Long overdue procurements. Yes govt neglect of defence strategy in the past as PeterL points out. I am an American that works for a competitor of Boeing. So I have no stake in an argument against the P8. The P3 is a venerable aircraft, however, beyond its years. The P8 is an absolute must-have asset. Australia – yes, I have been there – requires this technology to keep her borders safe. This AC will represent the next decades of years security, as the P3 had. I’m not someone with the military background that you gentlemen have, but I applaud a government who does its best to keep our ADF up to date and not like the governments in the past who waited almost too long to see the need for up to date military to defend our great and vast country. Remember the Brewster Buffalo. Perhaps one of you can explain why we need 15 ? Why are the winglets deleted compared to the commercial equivalents? It is not a war mongering…..pro war stance; increasing our spending our spending on defence, it is responding to the evolving strategic issues on our doorstep. Asia; is the fastest growing market on defence spending in the world..
Do you want Australia to be left behind; were we are not able to defend are borders & project our interests? We need 15 (or more) to cover all the work that they are tasked to do, and to cover maintenance. They’re using raked wingtips (ala 777), better optimised for the flight profiles expected to be flown. Winglets as used on the standard aircraft are optimised for a different flight profiles. Winglets have been replaced with a new patented “raked” wingtip similar in design that Boeing has used on the newer 777’s. Well done all with a lot of correct points here. Whats wrong tipo scared your Gov payments may be cut? unlike the dole Defense spending is capped and actually provides employment as well as Defense for this great Nation. Do know about rising tensions in the Spratly Islands with an increasingly militaristic country bullying its neighbors and building Military Island Bases to enforce their will on others as well as being able to cut the communications over and under the ocean if they so wish. So to the P8’s, they will be used to patrol and monitor this area as well our immediate surrounds to ensure Australia’s and its allies have the free passage they enjoy today. I’d simply like to clarify the comment by Chris earlier, the P3 type has been operated by the RAAF since 1968 when we acquired the initial 10 P3B airplanes. In the late 70s, the RAAF added a squadron of 10 of the later P3C airplanes. Then, in the early/mid 80s, sold the older P3Bs back to Lockheed, replacing them with the newer, updated P3C. So although the type has been in service with the RAAF for nearly 50 years, the actual airplanes are not 50 years old. They are a great airplane, and served/are serving Australia extremely well, I know, I flew them for 10 years, nearly 6,000 hours.